The Utah Condensed Milk Company Plant, known locally as the Sego Milk Plant, was built in 1917 to provide a market for the dairy farms in this part of the Sacramento Valley. Fresh milk was hauled to the plant twice a day to be processed into condensed milk, evaporated milk, powdered milk and powdered ice cream. 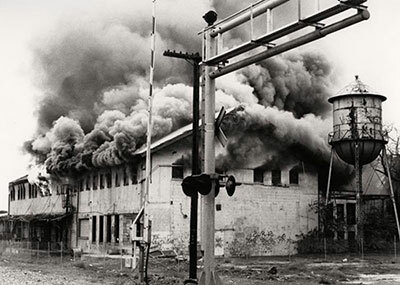 On November 24, 1992, the deserted plant was destroyed by fire. 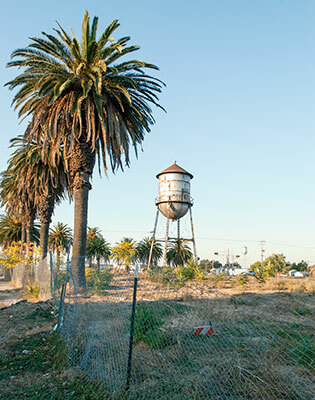 Only the water tank still stands on the empty lot beside the railroad tracks. The photograph of the fire is from the excellent and informative website of the Galt Area Historical Society.